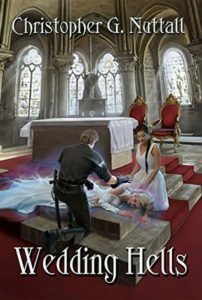 The eighth Schooled In Magic book by Christopher G. Nuttall has yet another great title, Wedding Hells. School’s out for the summer and main character Emily’s first beau, Jade, is marrying her best friend Princess Alassa of Zangaria in the wedding extravaganza of the century. Having learned her lesson after she agreed to host a faire without looking into the details, Lady Emily escaped the terrible task of Maid of Honor, which involved shepherding more than a dozen spoiled noble debutants. But she still has to negotiate the social landmines of Zangarian society and to try to keep the wedding party from killing each other—especially when a girlish game of truth or dare leads to some extraordinary revelations! Meanwhile, the whole kingdom is on edge due to the changes brought about by Emily’s New Learning. Broadsheets appear every day with rabble rousing messages, urging the lower classes to take a stand, and the new assembly is uneasy because they fear the king will not keep his promises. Into this explosive mix comes a mysterious feminine figure egging the rebellious to greater acts of treason. Could this mysterious sorceress be someone Emily has met before? Emily, however, she has a worse problem. A demon once showed her visions of the future, and one of the things she saw was Alassa, in her wedding dress, covered with blood. Will this vision come to pass and, if it does, what will bring it about? Could the archaic sword Emily just gave Jade as a wedding gift have an unknown curse? Or will the cause be something even more unexpected? It is interesting to see how quickly the world changes as modern notions come to play. Whether it is the spread of hamburgers and pizza or the spread of learning, trains, and guns. All this happens much quicker than it did in our world, because we had to work out each improvement over many decades, while the Nameless world has the advantage of all of Emily’s knowledge…including solutions to problems we have solved here that might have otherwise taken centuries to figure out. The New Learning has the potential for great good for the citizens of the Nameless world, but it is producing great upsets as well, as the established orders tremble as the new ideas question the underpinnings of all of society. Personally, I did not enjoy parts this book quite as much as the rest, but it was for purely personal reasons. We each have settings we adore and those we can only take in small doses. One that I have to really be in the mood for is the insurgents with muskets period—I just kind of can only take it in small doses. So some of the goings on in this book were not as much to my taste as the magic school and military fantasy volumes. But that is not a strike against the story, which was quite an exciting tale with twists and unexpected turns, some of which will most likely come back to haunt Emily in later adventures. Not only does Void show up in the beginning to help Emily recover from the damage done during her deadly duel with Master Gray (at the end of the last book) but he shows up again at the end of the story. The only thing that could make Void fans happier would be if he proposed marriage… Okay, maybe he doesn’t actually propose, but he does offers Emily a ring in a box–and we all know what that would mean on earth. Of course, the Namelss world isn’t earth–but he is still there when Emily needs him and that is very encouraging. 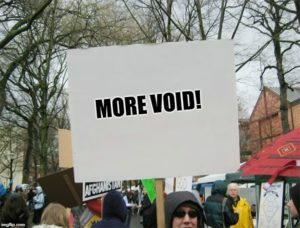 So much Void. Sooo wonderful.